Today we’d like to introduce you to Christopher Turgeon. Christopher, please share your story with us. How did you get to where you are today? All my life I have been drawn to the water. Whether it was fishing, diving, surfing or working on boats I did everything I could do to be by or on the ocean. I worked for 10 years as a deckhand on charter and commercial fishing boats before I found my true passion and calling. At the time I was working on a fishing boat in Newport Beach when a friend asked me in if was interested in working on a parasail boat. Of course I jumped at the opportunity to do something new and exciting. I worked as a crew member learning and taking in everything I could on parasailing for the remainder of the season and fell in love with the sport. My second season I began my training as a new captain which I quickly mastered and took over as Captain permanently. 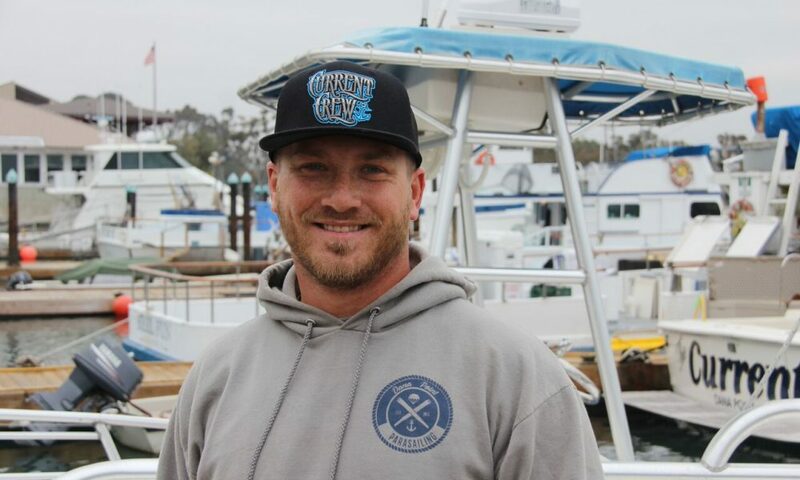 I spent one more season running that vessel in Newport Beach hiring, training new crew members and operating the business gaining all the knowledge I could for what I knew I wanted to do in the future. The season following, I moved to Catalina Island working for the same company captaining the local Parasail boat. The island weather offered a whole new learning curve to driving, forcing me to adapt to constantly changing conditions which, in the end made me a safer and more warry Captain. After almost 3 years of flying on the island I decided it was time to make my dream a reality, buy a boat, venture out and start up my own Parasailing operation in a location of my own. With the help of a good friend and now Partner, Joseph Rinehart, we purchased a boat and the real work began. After more than a full year of struggle we finally managed to get our foot in the door and talk to the right people allowing us to begin operating out of Dana Wharf Sportfishing in the beautiful Dana Point Harbor where you can fly with us soaring 800 feet over our beautiful Doheny state beach. Alright – so let’s talk business. Tell us about Dana Point Parasail – what should we know? Here at Data Point Parasail we offer the most premier and memorable experience in southern California. With our licensed Captain and Experienced crew, you are sure to have to the time of your life flying 800 feet over California’s beautiful golden coast. Nowhere else in Dana Point can you experience the views of our Beautiful city, Beaches and surrounding snow covered mountains all at the same time. There is an extremely long list of names of people that deserve credit that I don’t even know where to begin. First and foremost, my wife deserves a lot of credit for pushing me supporting me and never letting me settle. Second, would be a huge thanks to all the previous captains I worked with who all taught me something different. To name a few Cody Munson, Michael Perrin, Shane Williams, Keith Kimbrough, & Ryan Price Williams. Lastly the most credit goes to my friend and partner Joseph Rinehart for all the support and trust he has given. Without him I would not have been able to start this company.